Is it just me….or does it feel like January is flying by? Seriously! It feels like just yesterday that we were ringing in the New Year, watching the ball drop, having confetti dumped all over our living room (which, by the way, we are still finding to this day….) And now, we’re less than two weeks away from the Super Bowl and just three weeks from Valentine’s Day. Time flies when you’re having fun! Almost as quickly as it flies when you’re supposed to be selling Girl Scout cookies. Like….right now. Yep, Girl Scout cookie sales are underway. And even though it feels like we just got the order forms yesterday, the truth is we only have 4 days left to sell the heck out of those cookies! It’s a little wild this year, because we have THREE kids selling. So even though we’ve sold close to 100 boxes, when you divide it by three, things aren’t looking so good. And yes, Jorden has taken the order form to work. Ha! So I guess there’s nothing left to do but hit the streets, make some more phone calls, and hope for the best. Like I said, time flies when you’re having fun. And then, before we know it, selling cookies will be a distant memory and all thoughts will be on game day recipes. And Valentine’s Day. 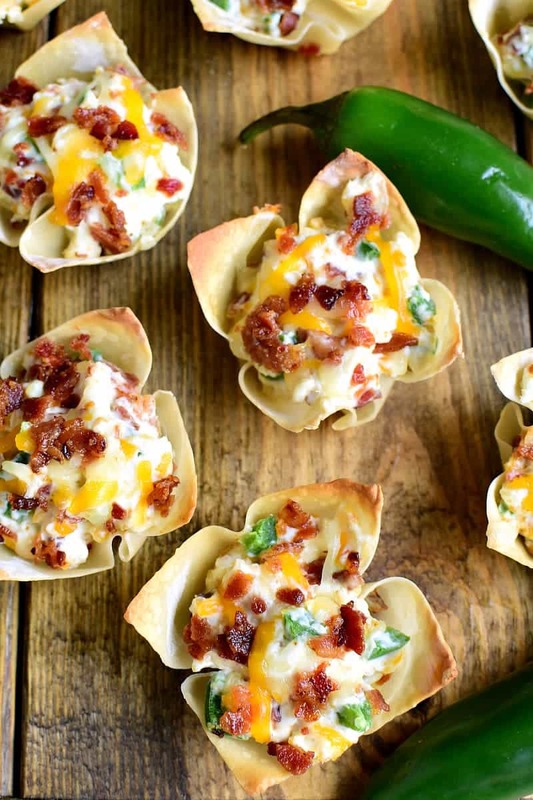 And….these Jalapeño Popper Wonton Cups! 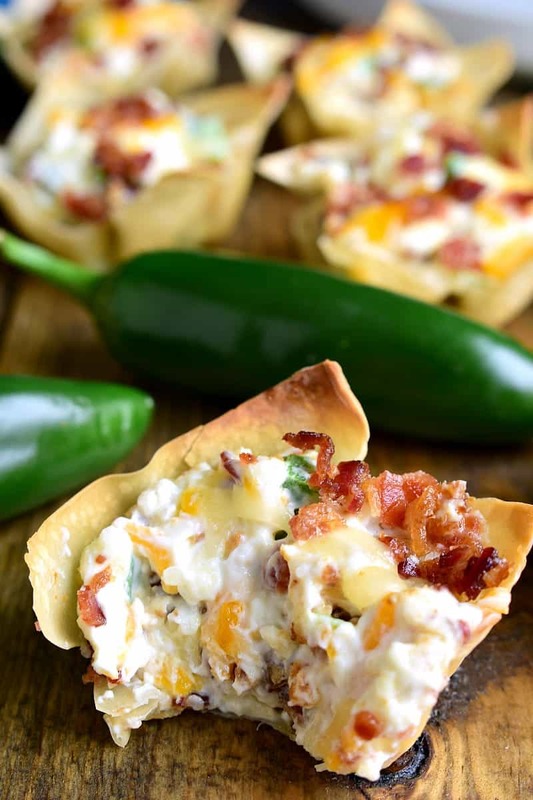 These easy game day appetizers are loaded with all the flavors of jalapeño poppers – cream cheese, bacon, jalapeños, and cheese – and baked inside a crispy wonton shell. They can be prepped in advance and baked in no time, and they’re almost guaranteed to be the hit of any party. You better believe they’ll be on our Super Bowl menu and probably on every game day menu from this point forward. 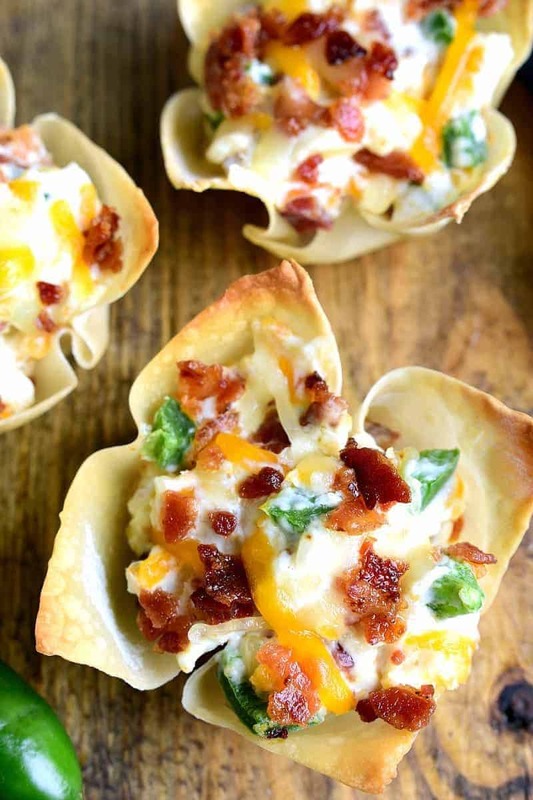 Truth be told, I plan on making these Jalapeño Popper Wonton Cups as often as I possibly can. They’re just THAT good. And you know what? 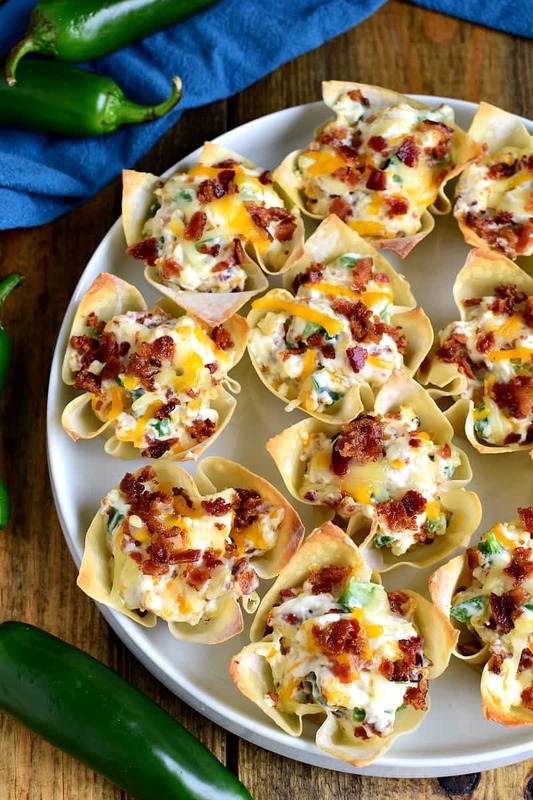 I firmly believe making (and eating) delicious things like these Jalapeño Popper Wonton Cups helps make these long winter months feel shorter. Kinda like Girl Scout cookies! So make….eat….enjoy! You won’t be sad you did. HOW DO YOU MAKE WONTON CUPS? Start with wonton wrappers and a greased 12-cup muffin pan. You can find wonton wrappers in the produce section of your local grocery store. Press wonton wrappers gently into muffin pan and pre-bake. This step is essential to ensure crispy (not soggy) wonton cups. Bake filled wonton cups until golden brown; garnish as desired. Store leftovers in the refrigerator and re-heat in the oven. WHAT KIND OF FILLINGS CAN I PUT IN WONTON CUPS? When it comes to wonton cups, the possibilities really are endless. You can make them savory or sweet, and when it comes to flavor combinations, the sky’s the limit! A couple of our favorites? Southwest Chicken Wonton Cups, Buffalo Chicken Wonton Cups, and Crab Rangoon Wonton Cups. One is seriously better than the next! And if you’re looking for a sweet option, you can’t go wrong with these Mini Apple Pie Wonton Cups! 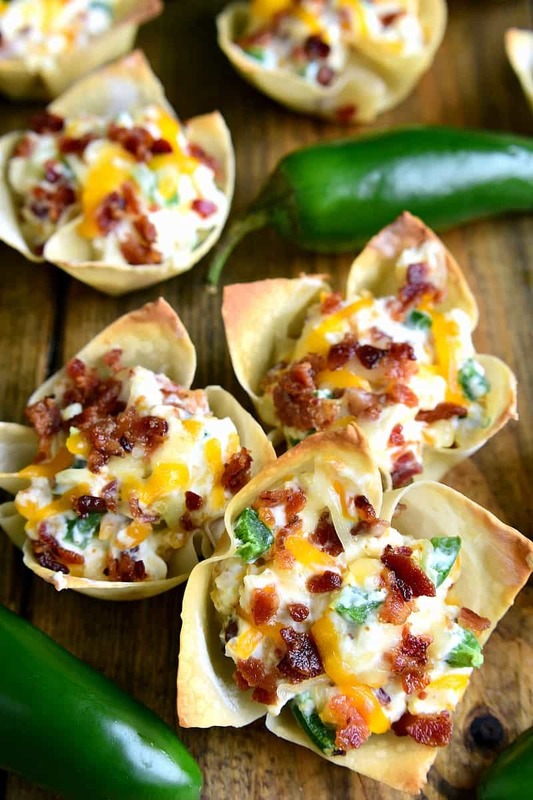 I hope you like these jalapeño popper wonton cups as much as we do! 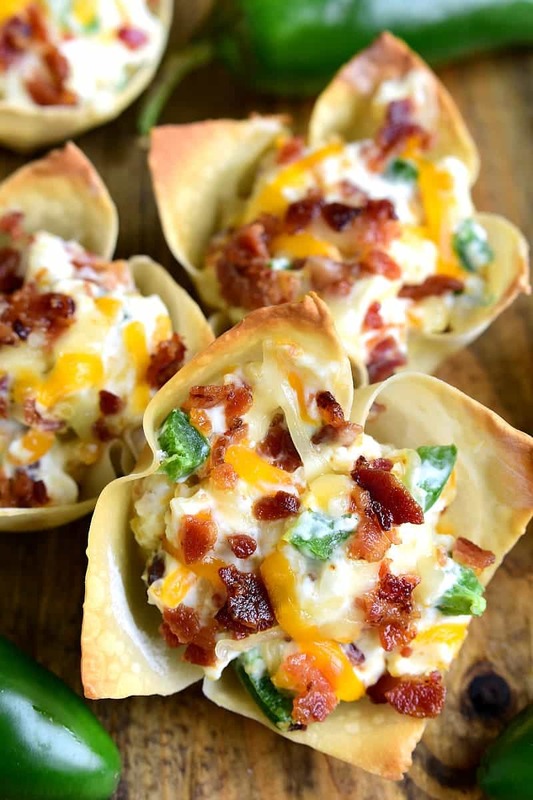 These Jalapeño Popper Wonton Cups are loaded with bacon, jalapeños, cream cheese, cheddar cheese, and sour cream....all in a crispy wonton shell! The perfect party or game day appetizer! Place one wonton wrapper in each muffin cup; bake 10 minutes or until lightly browned. Want to make a few more spicy appetizer recipes? Try these! Love this idea!! Perfect for the Super Bowl. For me it actually feels like January is dragging. Not sure why since I’ve been crazy busy. Maybe it’s because of the weather? I’m totally a summer person and cold weather just bums me out. these are made in the mini muffin pan aren’t they? not a regular one? I used regular tin but don’t usually fill totally full.
. Added a cpl more oz cream cheese, a little more cheese & bacon to make dbl batch.
. I like baking wontons on 400 vs 350 – quicker & nice & tan. I would think the mini tins. That would be too much in a regular tin. I agree. Would use mini muffin pan. made them in a regular tin, not big at all. Had a neighbor try and he said they were delicious. I made them in a regular tin and they turn out ok. I just added onion and garlic powder. Out of 12, my husband ate 9 lol.He really likes them. His lucky coz I tried to loose weight. Thanks for the review !! I’m making them today!!! If you use 2 wrappers, do you increase the first cook time? I would make them in the mini size. I made them in a regular tin, but you can also cut the wontons and use mini muffin tins. I made this recipe using SMALL muffin tin. I made 48 of these for a football game. Not bragging, but this was the first appetizer to disappear! Really delicious. I’m going to be making this for a party in a couple weeks and I know there are some people attending that are vegetarians. I’m going to omit the bacon from 12 or 18. I’m sure it’ll be just as good. I added chipotle to give it a smoky flavor and make it vegetarian. My family is vegetarian and we use the Morningstar veggie bacon as the substitute. Should you want to try it with veggie sausage, look for Gimme Lean veggie sausage in the refrigerated section of the grocery store. I made them just now… in the mini pan… pretty good, but the harboured jalapenos weren’t very hot… Will make these again! Video shows regular cupcake size muffin tin pan not mini. What about using canned diced jalapeños to save time?? Yes or no? I make a stuffed jalapeño that uses spicy breakfast sausage. You can use the mini peppers too. Cream cheese, cooked sausage, stuff the peppers top with parmesan cheese. Yum! I’m going to try these too. They’d be delicious with sausage! You can definitely sub sausage for bacon. I’ve made them this way before. So many variations on this can be done. These would disappear quickly around here! It doesn’t get any more perfect than this for the super bowl! These look delicious, and they would go fast in my house! Holy moly do these look good, Cathy! I need to put these on our Super Bowl Menu! I love these so much! Great for the Super Bowl! What a fun idea! Jalapeño poppers are always such a popular appetizer and I love the thought of switching them up. Everyone loves Jalapeno Poppers! This fun new way to serve them is going to be a hit for sure! I made these without the jalapenos because I can’t do spicy. They were great! Just an FYI Jalapeños are not spicy IF you remove the seeds. The “heat” is in the seeds. That is incorrect. They do still contain heat. Removing the seeds and the membrane only lessens the heat level, it does not remove it completely. I totally agree with you kylnsht! I was taught a trick where you bring a pot of water to a boil, drop in the whole jalepenos for just a quick boil until their color slightly changes, about 3-5 minutes. This helps lessen the heat in the jalapeño. Let them cool to the touch, slice them open lengthwise, remove seeds and membranes, and put them in food processor for tiny little pieces. You get the flavor and some heat without it being too much. Not sure what area you live in but I buy “Tamed” Jalapeños in a jar and they give you the taste of jalapeños with very little heat. I cannot do a lot of heat and spiciness but I LOVE these! The heat is also in the capsaicin, which is in the membrane. Remove the seeds AND the membranes, then rinse under warm water. Use gloves so the heat doesn’t get on your skin and burn! And the white membrane as well. I’m really excited to make these for a pot luck at school Friday. Do you use a regular muffin tin or a mini one? I would say a reg size muffin pan.. should do the trick. I used regular muffin tins, but they can be made smaller by cutting the wonton wrappers. Cathy, Again someone asked if these can be frozen. If they can how would you reheat???? I would imagine they can be frozen, although I haven’t tried it. I would reheat at 400 degrees….I am thinking around 20 minutes but would check progress at 10 minutes. What do you think about making them before freezing them in the pan and then putting them in bags to store until you needed them in a couple days? If they’re frozen, you don’t have to Cook them before you freeze them do you? I’ve never tried making and freezing, but I see no reason why this wouldn’t work. I would NOT bake them in advance. Cream Cheese does not freeze well, it actually says “Do Not Freeze” on the box. I have tried freezing it and it had a horrible taste and texture after being frozen. You could use your airfryer if you have one to reheat them! 400’F for 5 or 6 minutes. Are these meant to be in the mini-cupcake pan?? Can pop whole right in mouth. Don’t get me wrong, I’d bathe in cream cheese……just seems like regular cupcakes size is a lot of cream cheese. I made them in a regular sized pan. They’re not very deep so it wasn’t an insane amount of cream cheese, lol. But it would work equally well in mini size! I made these in a mini muffin pan, 24 count, and they were perfectly bite size! They’re really rich, so bite size gives you a minute to taste it without it being overwhelming! Did you cut the wonton in half to make the mini ones?? I think I Like the idea of mini ones better! Hi have a shallow ‘muffin top’ pan. Will try that. These look delish!!!! You would need to cut the wontons if you want to make them mini. OM goodness! I would have to triple that recipe to even begin to have enough in my house of boys! (including dad) And they would still be begging for more! WHat a wonderful treat though! I say treat but I am sure they would make a meal out of them! This is one fun and easy recipe I am truly saving! Thank you! Are these made in standard muffin, or mini muffin pans? I made them in standard muffin cups. You could also make them in mini cups but would need to cut the wonton wrappers. Yes!!! If you buy the won ton wrappers and do not mistake the egg roll wrappers … They fit perfectly into the mini muffin pans . :-) Bite size ! Would these hold if made the night before and then reheated? Made these today and they are fantastic. I added some taco seasoning to the filling and used a can of chopped jalapeños since I didn’t have fresh ones. They were very easy to make. Made these for a gathering with my girlfriends last night. They were excellent. I forgot to pick up bacon and they were still delicious. I used 4 jalapenos and they were not spicy at all. Very easy to make. These are awesome!! I’m on a jalapeño popper kick, so anything related is something we’ll try- this is an awesome and interesting way to have poppers. My husband and I loved them! Can’t wait to make them during football season. Thanks! I think I’d like to make these with crab so that they’re more like crab rangoons. I’d also have to omit the jalapenos, because I have zero heat tolerance. Can you bake these and then freeze and then thaw and reheat to serve at a later time? I haven’t tried them this way, but I’d imagine that would work. To reheat, I would suggest 400 degrees for 20 (?) minutes?? Can I use bacon bits? If so, how much? Where can I get wonton wraps? There in the vegetable and fruit section but in the cold section had to call a friend to ask too. Do you have to defrost the wonton wrappers first? If they are frozen, yes. They come refrigerated from the grocery store. I made crab Rangoon same way. These look so good! Where do y’all find wonton wrappers? Sorry I just saw that someone asked this. I’ve looked in that section at Publix and haven’t found them. What store? Publix has them in the produce section. In my store it was near the mushrooms and tofu. could you use the chopped jalapenos in the can? Yes, those would work. They would give it a slightly different flavor but still delicious! If jalapenos are too spicy for you, perhaps you could substitute diced green chilies. Some heat, but not much. Have you made these in mini cupcake tins? If yes, how many does this recipe make? Has anyone tried this with canned nacho style jalapeños instead of fresh? Canned or jarred jalapeños would work! I have similar questions about these. Just wondering why the questions are not answered? It would be very helpful. Canned or jarred jalapeños would work if you prefer those! I made these for a football game yesterday and was shocked at how salty they were. Used the exact amounts of everything and made them with Trader Joe’s uncured bacon. Anybody else have a problem with saltiness? Mmmmm….. I love salt. As with any recipe, adjust it to suit your individual tastes. We did not find them to be too salty, but you could always use lower sodium bacon or just decrease the amount of bacon. I made these for a church dinner tonight. I followed the recipe to a T. Everyone devoured them and wanted the recipe! I got soooo many compliments. They were great!!! Go back to the main recipe, before you hit “make it”, or search for it on Pinterest under “jalapeno cheese popper wontons”. There are multiple versions of this to pin. I made these (doubled) for my monthly wine dinner and they were a HUGE hit! They were scarfed down pretty fast… next time I think I will have to TRIPLE it! Thanks for the GREAT recipe! I made these using eggroll wrappers, quartered. It made forty eight mini muffin, two bite poppers. I did need to double the bacon and cheese for the topping. Perfect size. Have made these several times. Big hit at the party. I’ve used regular and mini muffin tins. Both work great. Would like to assemble them the night before just wondering if the wonton holds up? I would bake the wontons, then cover them. Mix the filling separately and spoon it into the wontons right before the final bake. Hope this helps! I was a little dissapointed with these. Tasted more like bacon and cheese appeptizers than jalapeno poppers. Will add more jalapeno peppers and put less filling in each wanton. I love to make a variation of tbese… I use a mixture of imitation crab meat and little salad shrimp instead of bacon, OMG sooo delicious ! I made these with a regular muffin pan. I used egg roll wrappers instead of wonton wrappers. I cut the egg roll wrappers 3/4” on two sides so they would fit better in the muffin pan. The amount of filling was perfect – not an ounce left. I knew the wonton wrappers would not fit the regular pan and since the recipe says it only makes 12, I figured that the filling would overwhelm a mini muffin pan. How long can these be left out? I’m having a company party and want to take them but not sure it they can be sitting out very long. I make a lot of things with the Mini Phyllo cups that can be found in most grocery stores in freezer section. Gonna give a try both ways!! YUM sounding, anything Jalapeño is always a hit! Thanks for the recipe!!! I can’t find wonton wrappers. Can you use phyllo paper or spring roll wrappers? Wal-Mart in the produce section. I had to ask. Made these just added some chopped red onion and the were wonderful!!!!! Will make over and over!!!!!! These are delicious! I added green onions and my family and friends love them! Definiteley a crowd pleaser! Thank you! I made the appetizer once and found it to be kind of tedious. The next time I just made the filling, heated it in the oven until melted and served with chips! Easy and delicious. Thanks for the recipe! I want to make these for a potluck at work, but have no way of heating them up once I get to work. Are they good cold, or do they really need to be warm? Good luck! Hope they turn out delicious! Made these last night….making them again tonight because someone got part they didn’t get any. Big hit in our house ! I made these as written, using a regular sized muffin tin, and they were great! The only thing I did differently, was to use cupcake liners instead of spraying the tin, because I couldn’t find my good cupcake pan. DON’T use cupcake liners! The wontons didn’t crisp up as nicely as they would have if left against the pan, and some fell in on themselves after the first round in the oven. I had to reshape them while hot — not fun. Other than that, a great treat, loved by all.I will make these again and again, as soon as I find my decent muffin pans! Thanks. I made these yesterday for a Christmas party and they were delicious! Will definitely make them again. For those of you who asked about leaving these out at room temperature and whether they tasted as good – they are definitely best hot out of the oven but about half of what I took sat out for almost two hours (we were bowling – couldn’t eat) and they were still pretty darn good. Let’s just say I didn’t bring any leftovers home! Just made these and hubby and I ate all 12!!!! Planning to make these for Christmas Eve Snack Supper! I want to use this recipe for a formal function so I tested it today. It’s defiantly a keeper. I added some paprika and red Chile flakes. I just pulled these out of the oven for an office party tomorrow. I had to sample one to make sure they were ok, and boy, they are wonderful!!! It was really hard not to eat another. I used regular sized muffin pans and 2 wontons. They came out perfect! This is a great recipe. Thank you! Delicious and easy to make. I made these in mini phyllo cups. So easy! The recipe was enough to fill 30 cups. I used 3 jalapenos and will try 4 next time for a little more kick. I also made the filling several hours ahead of time and filled at the last minute. Baking time at 350 was about 10-12 minutes, because filling was cold. Will definitely make again! Thank you for the great recipe! I’m so glad to see that someone made these with the mini phyllo cups because my grocer was out of wonton wrappers and that’s what I bought as a substitute! Can we use the phyllo cups for these?? Making them tonight …super excited!!! I used mini muffin pan to pre bake the wontons. I also changed the recipe slightly by roasting the jalapeno peppers before chopping them and with the bacon I added green onion. Delicious! Can i make the filling the day before and keeo in the fridge? These are a great party popper!! I made them for a Christmas dinner last week and they were all gone within the hour. Everyone loved them! Thanks for sharing the recipe!! And I used the mini muffin pan that made 24 so I doubled up on the cream cheese. I used the real bacon bits by Oscar Meyer and zap them in the microwave for a minute to make them crunchy. I also had a little dip left over that I left in the fridge and fixed more two days later, it was still delicious, so I think it is ok to make the dip the day before. 🙂 Thanks again!!! Made for my family’s Christmas and they were a hit. I did use mini muffin tin and worked great. Would definitely recommend! Has anyone made these with Monterey Jack cheese instead of cheddar? Made these in the regular muffin pans using 2 wrappers. Added Vidalia onion for a softer taste. Going to make them for the game this Sunday but using Poblano rather than the jalapeño, basically about 1/2 the heat. Had some filling left over and put it in a ramekin… it worked out fantastically. Thanks for the recipe! We made these tonight in the mini muffin pan. It made 24 perfect, tasty snacks. The wontons we used were the perfect size – no need to cut them down. We got them at HEB in the produce section. They are the smaller size. We went full seed. They had a nice kick to them! This has already been a hit with our neighbors too! Thank you for posting this awesome recipe! Made these for super bowl and were a great hit along with being super easy. I wish I could post a picture. Thank you! Forgot too add to my list a bit of green onion as well…. I have used a mini muffin pan twice and did not have to cut the wontons in half. HOWEVER, if you use the mini muffin pan, don’t precook your wrappers, otherwise you’ll be stuffing them with your fingers and a knife! Also had some rather large jalapeños so probably could’ve done away with 2, but needed to use them up. Wondering if these are made the day before an event and put into fridge does the wonton become soggy. Thinking of making the crab rangoon cups as well. Thanks. You could cut the amount of jalapenos used to 1 or 2. Actually these don’t have any real heat because you remove the seeds and bake them. These are great tasting and what a fun thing to make with all the jalapeños from the garden. Easy and fun recipe, thanks so much. I made these using a mini muffin pan. The only changes I made were that I doubled the recipe, used egg roll wrappers (bc the store I went to didn’t have the smaller wonton wrappers) and cut them into 4’s, used 1/4-ish cup of jarred pickled jalapenos with a splash of the liquid (bc they’re stronger and I like the pickled flavor), instead of reserving the extra bacon and cheese I used it all in the mix and added a fresh thin slice of jalapeno on top to garnish, and baked the wrappers in the morning and finished them right before my hubby’s work Christmas party this evening. They were fantastic!!! This sounds delicious! I’m going to use the pre-made frozen phyllo shells just because I really enjoy them. Love these! Much better if you rinse the flour off the wonton wrappers first. We enjoy your recipes, thanks for sharing. We would like to ask if you would include some suggestions for a meat replacement in them . We thought you might have some different ideas than ours for a meat substitute. We have seen this done in other recipe venues and it is a big help. Thanks again! Can you omit the cream cheese? I wanna make these for Superbowl (Go Patriots !!!!) I’m also going to add sausages, and crushed hot peppers that you use on a sub to spice up mine. I wouldn’t recommend omitting the cream cheese, but if you decide to, just make sure you add something to the sour cream to thicken up the filling. Hope you enjoy! What about a good old fashioned hot plate?